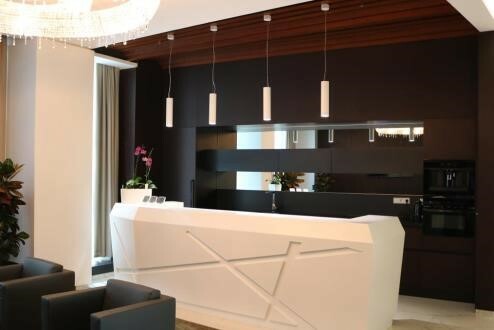 Baku, Azerbaijan: the new, world-class Bona Dea international inside and outside, with Corian® Solid Surface. Named after a healing angel of the Roman mythology, Bona Dea International hospital is a new structure recently opened in Azerbaijan&rsquo;s capital Baku and is the largest private hospital in the country. 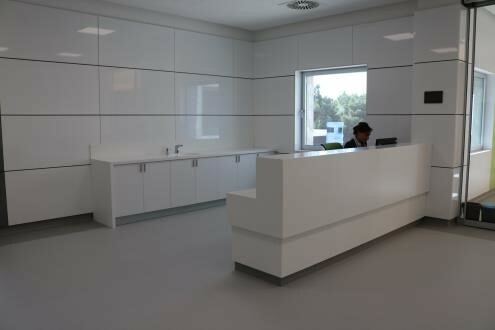 This modern health facility takes advantage of the aesthetic and functional qualities of Corian® Solid Surface which has been used widely used inside and on the facade of the building for creating many different design solutions. Bona Dea International hospital in Baku, Azerbaijan. The rooms and bathrooms are equipped with furnishing solutions made with Corian®; Solid Surface (Glacier White and Grape Green colours); photo courtesy of Palitra, all rights reserved. The combination of three colours from the large palette of Corian® Solid Surface (Glacier White, Grape Green and Dove) allowed achieving a clean, reassuring and calming atmosphere combined with exceptional aesthetics and could help the improvement and well-being of both the patients and healthcare workers. Helping with infection control is also an important issue in hospital interior design. 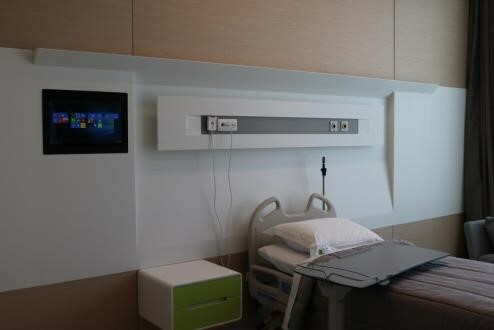 Corian&reg; Solid Surface helps creating inviting environments that meet the tough demands of healthcare. 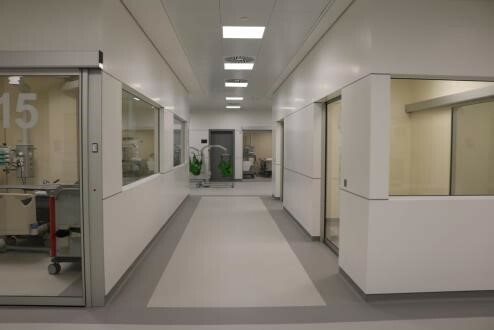 Corian&reg; Solid Surface ensures superior hygiene of every installation in the hospital thanks to its nonporous surface that, with proper cleaning, is able to resist the growth of mildew and bacteria. Being a solid material with the same properties &ndash; both in its nucleus and on its surface &ndash; it is a long-term solution, resistant to chemicals and liquids that is also renewable and can be repaired if needed. Also, inevitable scratches and stains could be removed easily by the maintenance staff. Bona Dea International hospital in Baku, Azerbaijan. The rooms and bathrooms are equipped with furnishing solutions made with Corian&reg; Solid Surface (Glacier White and Grape Green colours); photo courtesy of Palitra, all rights reserved. Bona Dea hospital benefits from Corian® Solid Surface great aesthetics even for the decorative white façade made with the Glacier White colour. 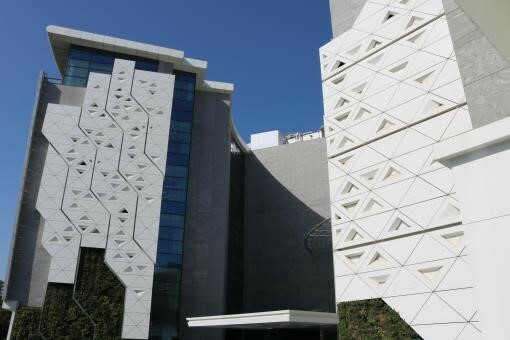 The material has been used to create geometric pattern that give a unique identity to the hospital façade which will remain bright and beautiful for many years to come. Besides the great aesthetics that Corian® Solid Surface offers when used as an exterior solution, its superior properties include high resistance to UVs and extreme atmospheric conditions. Bona Dea hospital has an extension of 37.500 sqm with 32 health departments. 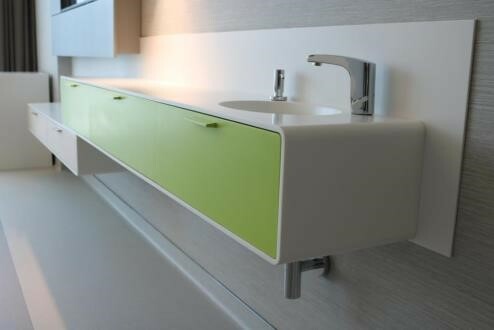 Corian® Solid Surface has been used in a wide variety of interior spaces such as wall cladding, bedheads, patients’ room furniture, bathroom countertops, window ledges, laboratory counters, nursery desks, as well as outdoor column cladding. 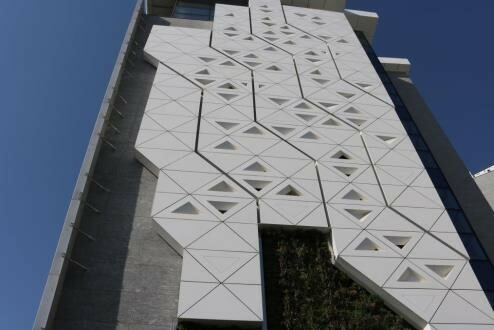 The fabrication of Corian® Solid Surface panels for both interior and exterior design solutions was made by Palitra, an experienced company based in Azerbaijan and a member of the Corian® Quality Network. Bona Dea International hospital in Baku, Azerbaijan. 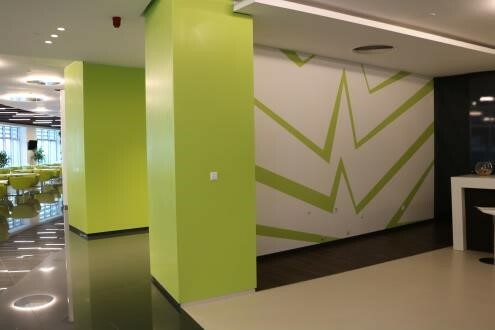 Furnishing solutions and column cladding made with Corian® Solid Surface (Glacier White and Grape Green colours); photo courtesy of Palitra, all rights reserved.